Hype cycles are the invention of a big American technology consultancy firm who use them to show the way very new types of technology move from ‘stupid idea, it’ll never work’ right through to general acceptance as something that just ‘is’. 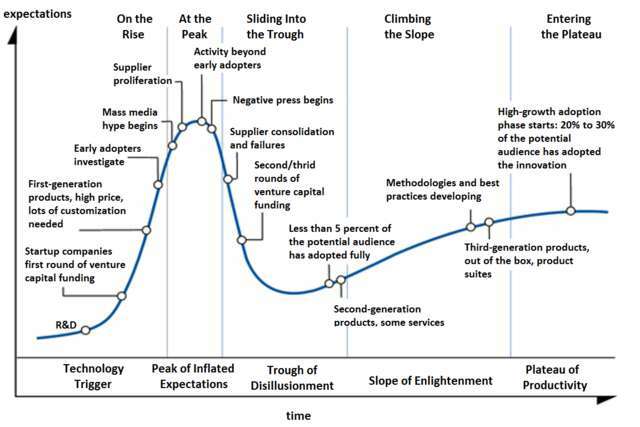 A hype cycle is basically a graph that plots a line that rises very steeply to a place called The Peak of Inflated Expectations, before crashing dramatically into The Trough of Disillusionment, and rising gently again through the long Slope of Enlightenment, before levelling off on to the Plateau of Productivity. I’ve always liked this model. It’s simple and elegant. It demonstrates very clearly how new things come along, wrapped in hyperbole and excitement, that are going to change everything, how people get hacked off with them very quickly, but then slowly work out what to actually do with them. All technology, all innovation, follows this simple model. It provides a superb way of understanding trends, and the inevitability of fashion. “Hype-Cycle-General” by NeedCokeNow – Own work. Licensed under CC BY-SA 3.0 via Wikimedia Commons. You can apply this model to food, and particularly to food fads … pulled pork, for example … stuck right in the Trough of Disillusionment (seriously, the damned stuff is everywhere). Craft beer? Riding the crest of the Peak of Inflated Expectations. I’d push proper, shorter measure coffee and real espresso out onto the Slope of Enlightenment, if I must. And what of beef rendang? There’s lots of talk of beef rendang. Everybody’s making it, and a quick call for advice on twitter revealed quite some passion for particular recipes, methods, tips and tricks. I think it’s the next big thing, rising like a rocket up that steep initial slope. It’ll become passe, it’ll have had its day at some point soon, but I have a sneaky suspicion that this fad will linger on, simply because a good beef rendang is a thing of considerable beauty. 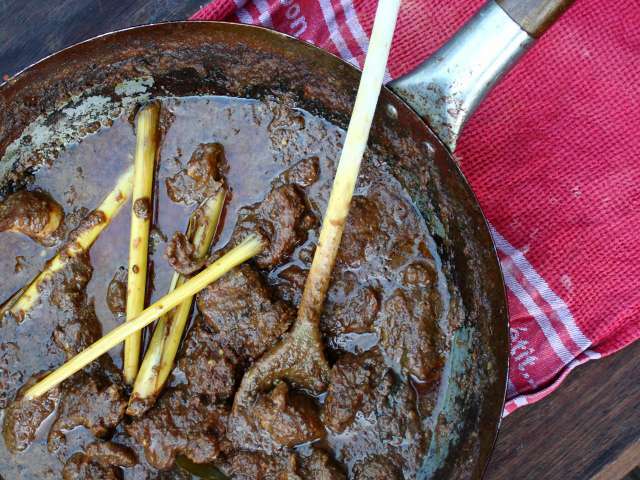 It might be fashionable now, but beef rendang is a centuries old classic, a staple of Sumatra in Indonesia. It’s a dry dish, very heavily spiced, which meant that it lasted well without refrigeration, in the days before there was such a thing. These things come and go, and every fad has an air of renaissance about it, a kernel of the past at its heart. Nothing is truly new. And on that note, this recipe comes from Rosemary Brissenden’s South East Asian Food, first published in 1969 and an encyclopedic walk-through of the food of Indonesia, Thailand, Malaysia, et al. Brissenden’s book, for all it’s faults, remains peerless. It is simply an astonishing resource, and one of the few books I’d suggest that anybody who wants to really learn about food, and to cook better, should own. So, beef rendang. The cut of beef is up to the cook. Brissenden recommends a kilo of topside, but I used shin, and ox cheek is uber-fashionable right now. All work well. To start, the beef must be cut into substantial chunks, about 5cm across, and marinated in a spice paste made from a teaspoon of dry roasted and ground coriander seeds, a 2.5cm piece of peeled ginger, a 2.5cm piece of peeled, fresh turmeric, or a quarter teaspoon of dried turmeric, four peeled cloves of garlic, ten peeled shallots, and – wait for it – nine teaspoons of ground chilli flakes. Yes, that is really, really hot. Grind all the paste ingredients together in a blender with a little water to keep things moving, and pour over the beef pieces, massaging the paste into the meat with your hands until everything is properly coated. Set the beef aside for a while to marinade. Overnight in the fridge is best. Tip the spiced beef and the remains of the paste into a wok, and add four tablespoons of grated fresh coconut, roasted in a dry pan until golden brown, and a can of coconut milk. You could substitute dessicated coconut for the fresh if you steam the desiccated coconut to rehydrate it. Add two stalks of lemongrass, a 2.5cm chunk of galangal and a couple of kaffir lime leaves, along with a teaspoon of salt, or to taste. Bring the wok to the boil, and cook without a lid until the beef is cooked and the sauce reduced. Timings are nearly impossible to give, because different cuts of beef will take different lengths of time, and the size of the pieces is also a factor – bank on at least an hour, but expect an hour and a half or more. When the beef is cooked through, raise the heat so that the gravy reduces quickly, then turn the heat down, check the seasoning, and continue to stir until the sauce has all but disappeared and the dish is quite dry. Brissenden notes that this final tempering is “crucial … the whole quality of the dish depends on the care with which it is done”.